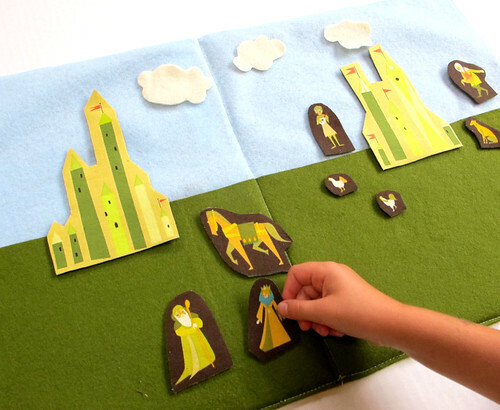 Soft Stories – Felt boards with story pieces are easy to pack, inexpensive to make, provide endless opportunities for imaginary play, and aren’t just for preschool classrooms. You can make or find online to purchase your own travel-sized felt board – and it doesn’t even have to actually be a solid board. My easy, homemade travel board takes about 10 minutes to make and cost me less than $1. You can also use a plastic binder or folder, or choose a different background color other than black. Then I found felt story patterns online and made my own characters, which I attached to the outside of the felt board in a plastic storage bag. You can create characters for specific stories, or just random characters and props so that your child can create her own stories and scenes. Make some Thanksgiving themed story pieces to go along with it and have your child create her own story about the holiday. Magnetic Stories – Pack a small cookie sheet and a set of fun magnets with which your child can create stories or pictures. You can even create your own sets of Thanksgiving or Christmas magnets by taking related pictures and adding self-adhesive magnets to the backs (I laminate the pictures first or use craft glue to attach them to cardboard). Travelling Photographer – Cameras aren’t what they used to be – which is great for young travelers. Inexpensive digital cameras are perfect for little hands to use to document the adventure. On one of our last vacations one of the most frequent sounds we heard from the backseat wasn’t children complaining – it was the clicking of the camera as our youngest snapped about every picture imaginable, including some fun (if not awkward) ones of his siblings sleeping in the seat next to him. Are we almost there? How much longer? If you’re travelling over the river and through the woods with young children this holiday season, don’t forget to pack your patience – and some of these easy travel games for little ones. ← How Do I Teach My Child to Read?